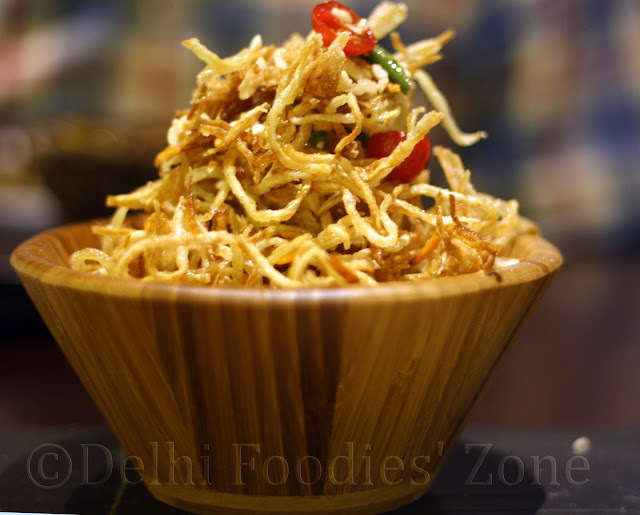 One of Skeeter’s most admired chefs is in India, has spoken to her and has fed her. 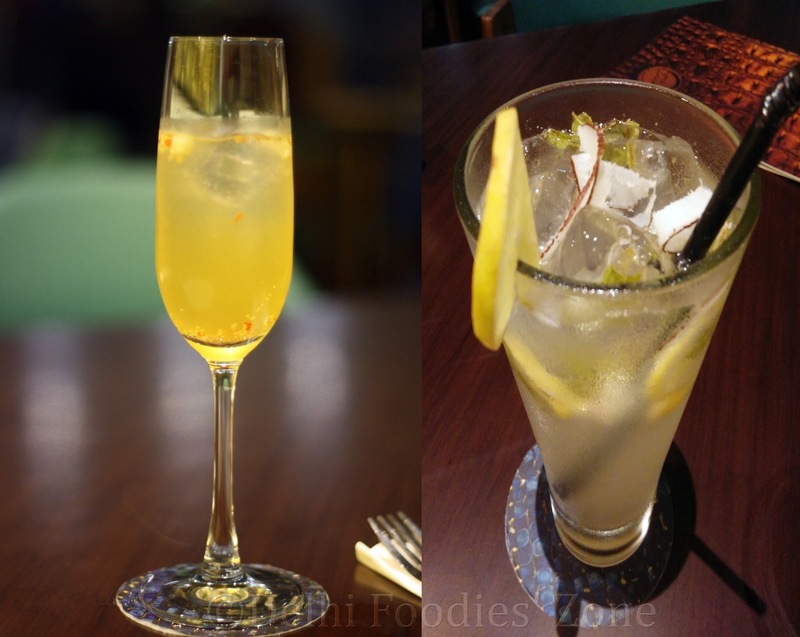 She’s still euphoric and has a hangover of the experience, the Gaggan experience. Meet the highest rated chef of Indian origin, Gaggan Anand. He needs no introduction, but for the uninitiated, he has worked with culinary greats like Ferran Adria and set up a very successful restaurant that goes by his own name Gaggan in Bangkok where he serves progressive Indian food. Gaggan and his team are like percussionists who have every rythm in order and show exemplary control over everything around. Not one thing goes astray. Perfection is their passion and it is manifested in their culinary actions. That would actually some up the Gaggan experience for Reeta Skeeter. Ahead of the most wonderfully organised, timed and structured culinary demo, Gaggan took pride in introducing his team which consists of wine specialists, research experts and more. He playfully names them Nut, Nacho and so on. 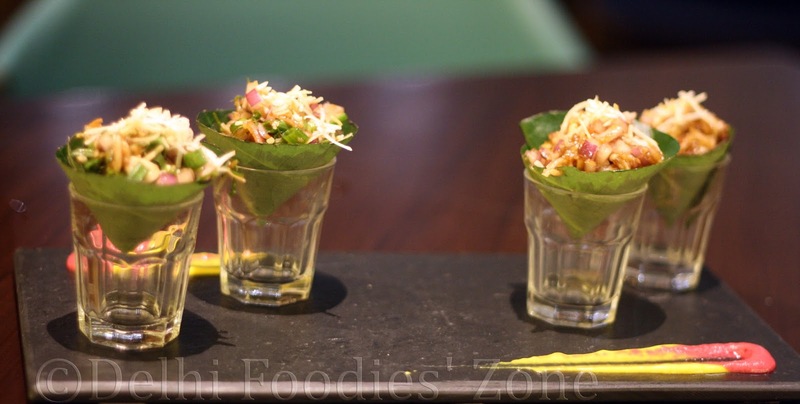 Like most modern chefs, he snaps at the mention of ‘molecular gastronomy’ and says what he and his team make is progressive Indian or modern Indian food. Gaggan Anand does not shy away from saying that the kind of food he serves should be had once in a while for the sheer magical experience. At the culinary demo, Skeeter sampled chef Gaggan’s spherical papri chaat yoghurt. By dropping a spoonful of spiced up yoghurt into a solution of sodium alginate the spherification happens and the result is a wobbly egg-like yoghurt ball that is fun to pop in the mouth and before you know, it explodes on your tongue reminiscent of the tang of your favourite street-food vendor’s papdi chaat. 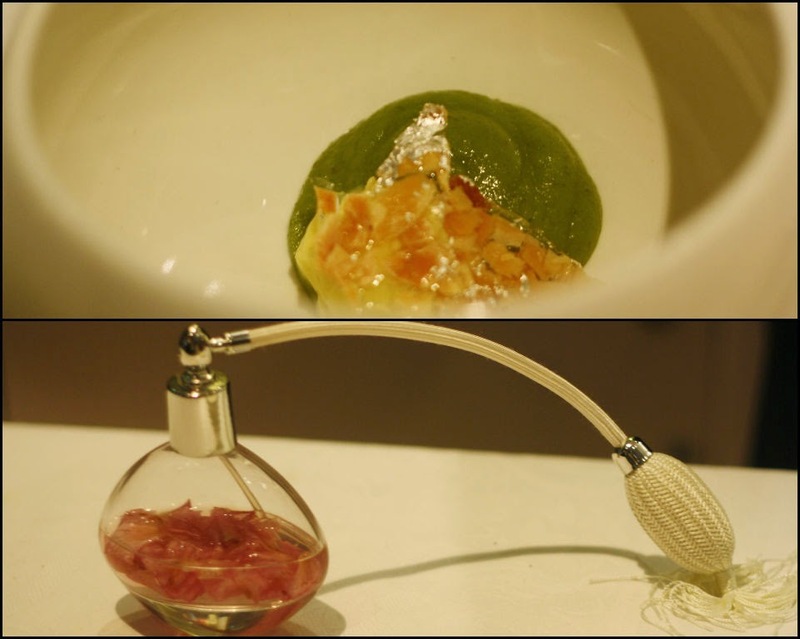 Though Gaggan and team demonstrated his techniques at ITC Marya, he actually serves this yoghurt in various innovative ways. Over papdis with some chutney foam, over some jhoori bhaja where it looks like a bird’s nest (do look up the web for this one) and so on. Creativity is infinite for this chef extraordinaire. 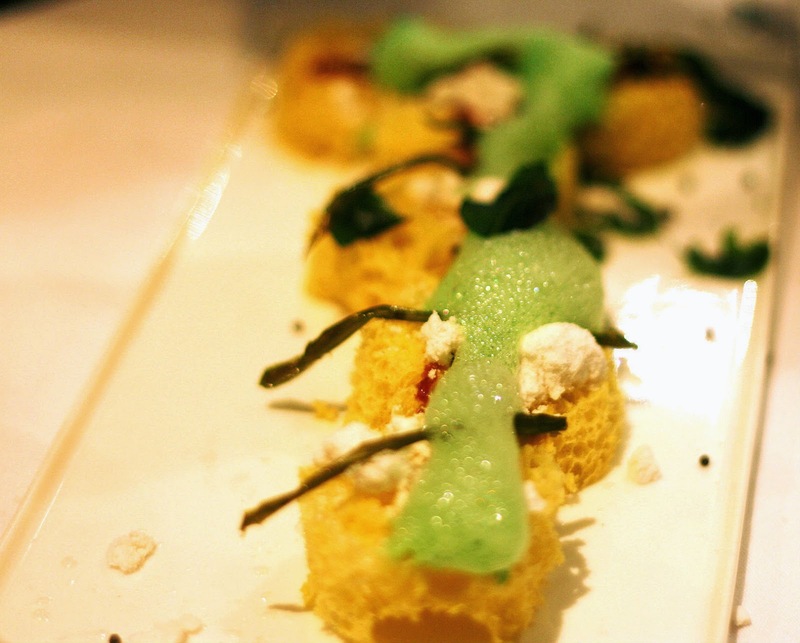 Dhokla with chutney foam, coconut snow and fried green chilli was showcased next. The usual dhokla batter is powered up by a nitrogen bullet, microwaved for 30 seconds and Voila! 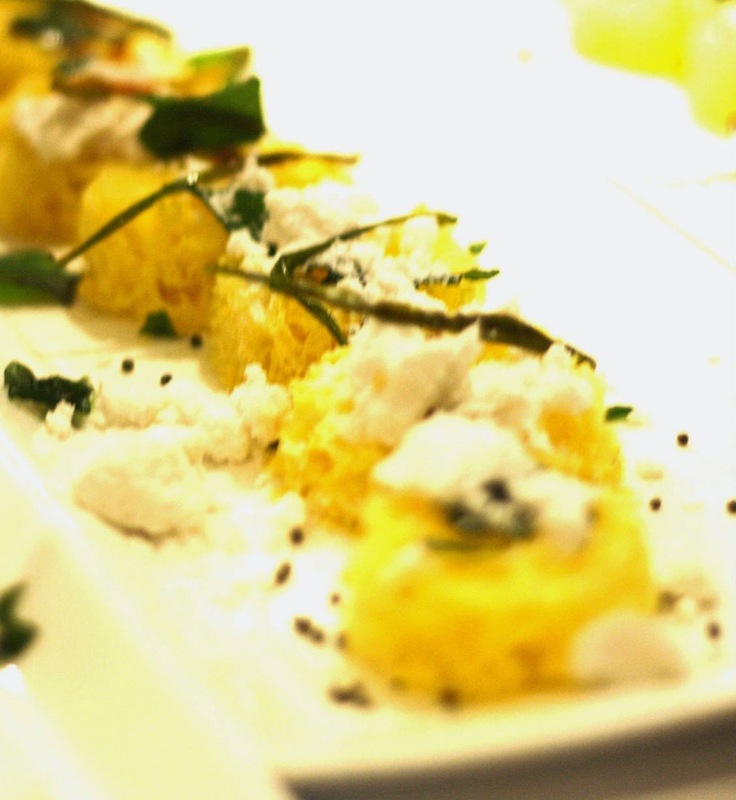 There is dhokla. It is easier said than done. One can achieve such results only when you know your root cuisine well and you have experimented with your version over and over. Gaggan surely has! There was a mind blowing Phirni ice cream made from the very fragrant Thai jasmine infused with kesar and served with a pistachio based gel, silver varq and caramelized chikki-like almonds. Skeeter wonders what results this dessert would yield with the Bengali rice Gobindo Bhog. Food for thought? What floored Skeeter was yet to come. A Mascarpone matcha tea cake sandwich with a brush of wasabi and a sprinkle of Vanilla salt. He may be known for his Indian progressive cuisine but the mascarpone match tea cake sandwich was a culinary revelation. Desserts in many a restaurant would have the mascarpone element. But Wasabi? Vanilla salt? Matcha tea? Skeeter loves a good Matcha tea ice cream. A perfectly frozen and well-composed matcha tea ice cream can be savoured bit by bit just like you sip tea and ponder. 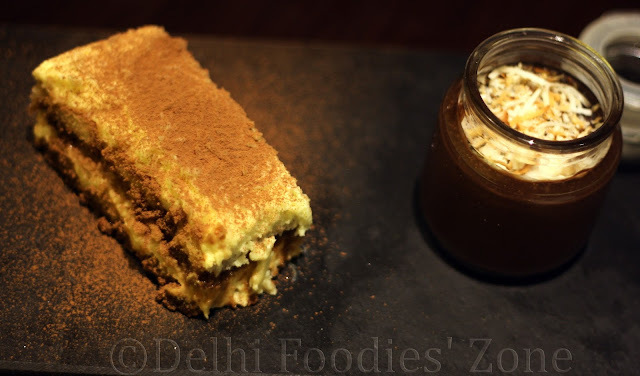 But with Gaggan’s mascarpone match tea cake sandwich one can only become well, plain greedy. 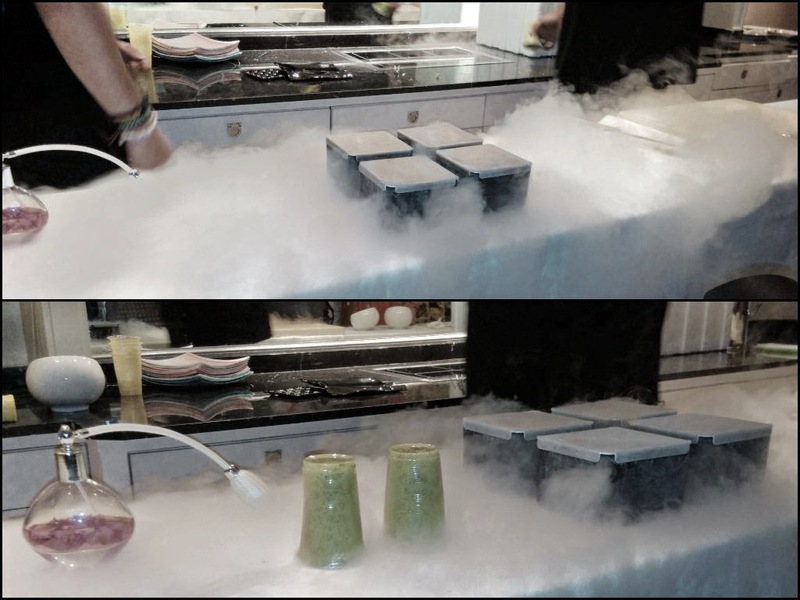 Gaggan uses liquid nitrogen as a base for iced-teppan to work with mascarpone cream cheese and a bit of sugar till it attains a cookie-like texture. He then uses a Shark fin grater to grate fresh wasabi and brushes the mascarpone cookies with it. 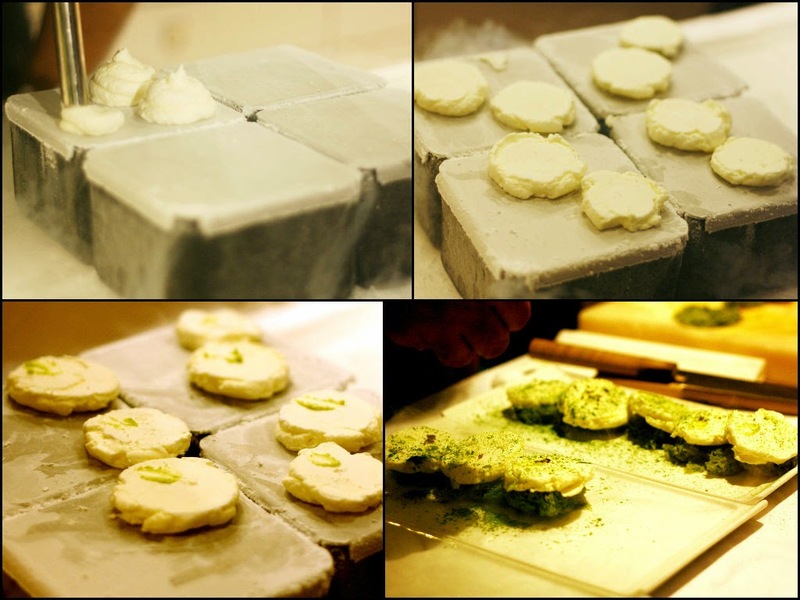 A sprinkle of vanilla salt and matcha tea finishes this cookie, which is then placed on top of a matcha tea cake (the tea has been picked personally by Gaggan from Japan a week ago and is packed with freshness). This dessert is a tribute to his love for tea, his love for Japan and to his own gastronomical adventures. The culinary demo was a sampler of the Gaggan experience for Skeeter. Gaggan spoke and shared a lot, he packed a lot into a very limited time whereas he could’ve easily got away by showcasing a lot less. This speaks volumes for the stellar kitchen performer that chef Gaggan is. He will prod you to read up about the gadgets he uses, freely share his ideas and recipes and most importantly give you back everything you paid in currency in the form of a culinary souvenir: The Gaggan experience. And this experience was enhanced by a brilliant support team in India: Mangal Dalal and Nachiket Shetye of Cellar Door Kitchen. Cellar Door Kitchen is a platform for pop up restaurant events founded by culinary consultants, Mangal and Nachiket. 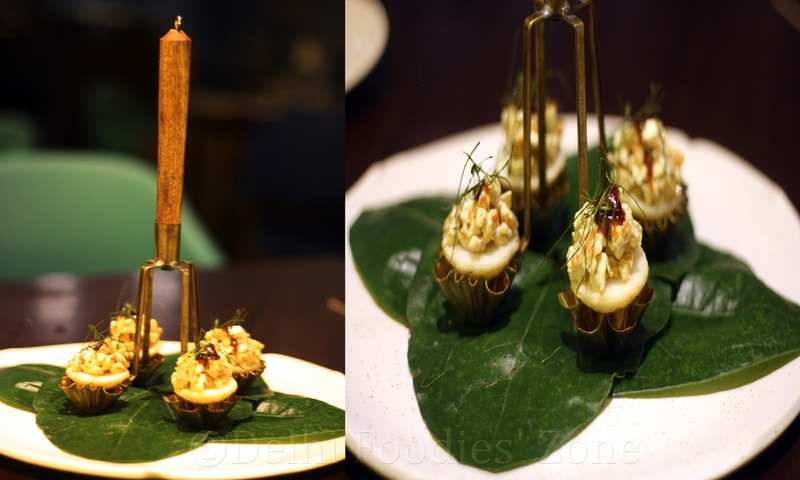 Gaggan’s unique pop up initiative is designed to delight food lovers with a degustation of progressive cuisine from Restaurant Gaggan at ITC Maurya in New Delhi from September 4th to 7th 2014 and later in Mumbai. For the first time Chef Gaggan re-creates his 11-course for tasting menu of progressive Indian cuisine with innovative cooking techniques in a pop-up in India open to all. Mangal and Nachiket are food lovers extraordinaire and part gnomes who have worked hard to change the Indian dining experience and deserve another blogpost altogether (read coming soon). The Gaggan experience, a cooking demonstration by Chef Gaggan Anand was presented by American Express, Cellar Door Kitchen and hosted by ITC.